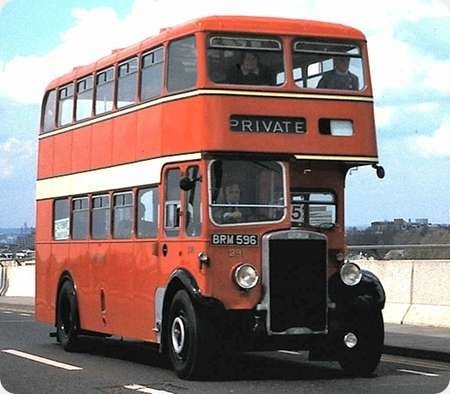 Cumberland 231 (AAO 34B) was a 1964 Bristol MW6G with the standard Eastern Coachworks B45F body. Of interest is the T-style destination display, which required the front dome to be raised above the natural roofline of the bus. ECW always managed to make this feature look like a natural part of the design, whereas some builders used to make this feature look like an "afterthought". The bus is seen at Seatoller, terminus of service 79 from Keswick. This exceptionally scenic route followed the Borrowdale Valley, and is nowadays operated by Stagecoach using open top double-deckers. 231 and a sister spent more or less all her life allocated to Keswick Depot, most of this time being spent on service 79. Always thought this was a neat little body on the MW and always preferred the 6Gs. I’m sure Westmorland and Cumberland were better tackled with this engine. The 79 was operated jointly with the "Keswick – Borrowdale Bus service" which consisted of Simpsons and Weightmans – one bus each I think, and for many years both of them Bedford OB/Duples. Happy days! I regularly travelled on one these workhorses to school. Cumberland provided 2 x MWs, 1 x FS, and 1 x FLF for the school run from Seascale to Egremont during the mid 1970s. In addition to the standard MW6G buses there were also a few MW oddities, numbered 222-226. These had been downgraded from coaches or dual-purpose vehicles and at least one of them still had comfy seats! 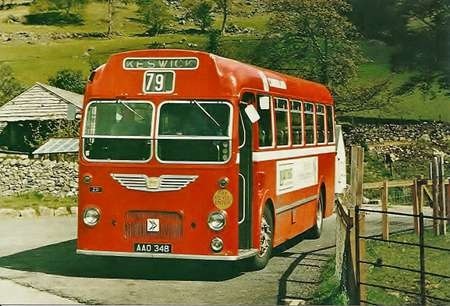 The MWs were especially suited to working routes that followed narrow winding roads into the valleys of the Western Lake District, including the 79 from Keswick to Seatoller, the 65 from Cockermouth to Buttermere, and the weekly 11 from Whitehaven into Wasdale. They also performed well on the less busy southern section of the long coastal route 12 from Whitehaven to Millom. The tight curve under the low railway bridge at Seascale determined a change of vehicles and an MW could just squeeze through with an inch on either side. Happily 231 is preserved having been purchased when it was withdrawn in 1980 by Richard Solyom, a Keswick schoolboy who travelled on it every day. This bus was actually new to Cumberland in 1963 but was kept in store for a year before it entered service Surprisingly in view of its operating territories sparse population Cumberland was the most profitable NBC company just before the NBC was dismembered. That’s very interesting regarding profitability. There were a number of rural routes though most of them were in the urban area between the coastal towns and former mining areas: Egremont, Cleator Moor, Whitehaven, Workington and Maryport plus the busy route from Whitehaven to Carlisle which still exists as a Stagecoach Gold service. The other factor may have been the large number of works contracts, especially for Sellafield. For a number of years my family had a Hotel in the Borrowdale Valley, (The Hazelbank Hotel in Rosthwaite), so I know this area very well. The Bristol MWs, now long since gone, were replaced by the Leyland National, the Mark 2 variety, with out roof pod, if memory serves me right. This run up the valley must be one of the nicest in the Country. I have in my collection a picture of 231 at the Seatoller Terminus in 1979, ready to operate back to Keswick. It is shown here. Yes, interesting comments about profitability. Being a bit parochial, I would have thought Yorkshire Woollen would have been close to the top of the list as regards profitable companies, indeed, Don Akrigg’s "Colours of West Yorkshire" book described it as "the BET’s goldmine" and with services into cities such as Leeds, Bradford and Wakefield and large towns like Halifax and Huddersfield, with numerous smaller ones in-between, one can understand why it was once a thriving network. To go back to Cumberland, as a matter of interest, does anyone know why, after decades of the Seatoller service being numbered 79, Stagecoach changed it to 78 a couple of years back? Dave a good point about YWD in the same area YTC must have been profitable too Cumberland were seen as top dog in the run up to NBC dismemberment when YWD no longer existed as such being under West Riding management. Chris Hough- the profitability of BET companies like YTC and YWD would be interesting to know: YWD seemed to suffer acute shortages of working buses, whilst the old YTC seemed to trundle round potentially crowded routes with a fleet of oldies and goldies- including oddities taken on from other operators. We don’t seem to have old YTCers on this site? Were these companies cash cows to finance the conglomerate’s expansion? A lovely photo from Don who draws attention to the raising of the roof line to accommodate the T-style destination. It very much depended on which past of the Tilling empire you were familiar with as to how unusual this was for down in Essex this was very familiar on Eastern National’s bus versions. Indeed when returning to the family’s home in Widnes/Runcorn there always seemed something odd about Crosville’s examples. Living Bristol Omnibus territory when I was a boy I remember riding on BOC MWs frequently to and from school in Wells. There were several allocated to Wells depot. They were fitted with T-style destination boxes front and rear. Made them look very odd to the Western National MWs I encountered. I remember reports in the newspapers (may it even have made television news?) about Richard buying this bus – it did give me a false-hope that my parents may have somehow contrived to buy for me a suitable YWD single-decker. I also remember a holiday in Seatoller around 1972, and remember watching these MWs come and go – they seemed very quaint to me back then, usual single-deck fare around Halifax having BET recessed or twin-curvature screens. Despite my entreaties we never took the opportunity to ride into Keswick on one . . . and the opportunity to ride on an MW never subsequently presented itself. Regarding the profitability of ex-NBC companies, I’m surprised that Cumberland was top-of-the-list in the run-up to privatisation – did the transfer of Ribble’s Carlisle-area workings have an influence? In the early 1980s I’m sure that Northern was the most profitable NBC subsidiary . . . but these things come and go. YTC’s profitability must have been hit by the decline in the mining industry (less colliery specials, less disposable income for travel), as must YWDs by the decline of the heavy woollen industry – indeed Arriva’s current network is just a shadow of that which the NBC inherited in the area. And both YWD and YTC must have generated a lot of income from the Yorkshire-Blackpool express traffic and other excursion traffic, which just evaporated through the early 1970s. He was definitely on the local Border TV news Philip. It gave me false hope too – I was offered one of Barrow Corporation’s Massey bodied PD2A/27s for £150.00 at around that time. Even if I had been able to raise the money my parent’s drive wasn’t big enough to park it! It’s a pity none survived – I always remember the big sliding entrance doors. The 79 was renumbered 78 because from c2006 Stagecoach in Cumberland found itself with two 79s- the other one an ex Western SMT route north of Carlisle which a group reorganisation had transferred into their hands. On the profitability point, in 1970 (a terrible year for the NBC) I remember trade press reports that only Cumberland and Southern Vectis had turned in a profit. By that time Yorkshire Woollen – and Hebble’s fleets – were in a terrible state. I remember Decrepit Regent Vs belching out blue smoke and the desperate enthusiasm with which YWD fell on Sheffield’s C fleet double deckers when the Joint Omnibus Committee was broken up at the end of 1969. Yorkshire Traction, by contrast, were in a much better state, I think the only second hand example sin the fleet had come as a result of company takeovers. If you look at photographs of the Yorkshire Woollen and Hebble fleet around 1970 you will see that there was no company pride. Bumps and scrapes not repaired and the bad sight of diesel stains when overfilling. Some of the destination displays were not 100 per cent. Somewhat surprisingly, Colin Shears, who is usually a parochial West Country enthusiast, mentioned to me that Cumberland used to run Bristol SC4LK’s along Borrowdale. Would this be the route they were used on? The SC4LKs in the Cumberland fleet were known as ‘Sputniks’. According to Harry Postlethwaite in his excellent Venture publications history of Cumberland, it is alleged that the first driver to take one out said, on his return. "They should have sent that up in the Sputnik!". That said they must have found them useful for the lightly loaded rural routes because the 5 purchased in 1957 and 1959 were supplement by 3 from United Counties and 1 from United Welsh in 1963 and a further 3 from ENOC a year later. They were used throughout the network from the web of services on the Solway plain south as far as Millom and inland to places such as Ennerdale Bridge, and on the 79 from Keswick to Seatoller. Despite this being a scenic route that penetrates the Lake District fells it follows the valley floor and, unlike parts of the coastal route, has no stiff climbs. All of these routes were later served by the MWs. Can anyone help me with details of routs/timetables special schools and works services operated by CMS Cumberland Motor Services.? Apart from timetables, the best source of information is ‘British Bus Systems No.1 – Cumberland’ by Harry Postlethwaite, published by TPC in 1983. This was later brought up to date as ‘Cumberland Motor Services 1921-1996 and published by Venture. Routes have inevitably changes over the years, especially following deregulation and take over by Stagecoach which brought in routes and vehicles operated by Barrow Corporation, and by Ribble in South Cumbria and Carlisle. Until privatisation the main area of operation was the former county of Cumberland. The main trunk route was the 30 from Whitehaven to Carlisle via Workington, Maryport and Wigton which took just over 2 hours with a headway of 30 minutes through much of the day. Other key longer routes included 12/13 Whitehaven – Egremont – Seascale – Millom, and 34/35 Whitehaven – Workington Cockermouth – Keswick. There were also town services, and a network of rural routes including market day only routes such as the Thursdays only 11 from Whitehaven to Wasdale and the 26 to Ennerdale as well as tourist routes such as the 79 Keswick to Seatoller. There was also parcels traffic and schools and work services. The latter usually carried the destination ‘works’ and included heavy traffic to Sellafield from various destinations (service 85) and from Workington to Lillyhall estate for Courtaulds, Heavy Duty Alloys and K-Shoes (service 90). There were also services to local collieries and iron mines – I often caught a school bus that had just come off the Beckermet Mine turn on a wet day, its floor red from the iron ore. There was also the 87 from Maryport and Workington to the West Cumberland Hospital at Hensingham (Whitehaven). Ex Eastern Counties ONV 430 was stabled at Cleator Moor and used on Service 44 from Cleator Moor to Workington via Moresby Parks, Pica, Distington and Harrington for several years. I clocked up many hours as a passenger on this route in the late 60’s and early 70 and I can confirm that it struggled with several of the ascents on this route – especially the climbs out of Harrington if it had to stop at Beckstone Bridge. If I remember rightly it was replaced by a LH (XRM 111J ??) before Cumberland closed the Cleator Moor depot and ran Service 44 from Workington to Pica with this service being operated by whatever was available – even coaches and DPs found themselves at Pica. The service 90 actually had the destination "Workmen". One of these carried on from the Lillyhall industrial estate round the loop road in Distington to form the Schools service 43 in the 80’s. This was an unusual route as members of the public could use the bus up to Workington bus station after which it carried on to Workington Grammar School and then on to Clifton. Standard fare on this route in the early 80’s were MWs LHs and flat front REs with T type destination blinds. You needed strong arms in those days as they often rostered vehicles with sticking doors. Nice photos my dad Tommy Thompson was a reguler driver of that vehicle, he was a Whitehaven driver. Mike Morton. You may remember me from schooldays. Occasionally I remember a really old single-decker (pre-A reg) turning up as the first bus from Seascale to Egremont. It had battered green leather seats with high curved backs and the engine was rather noisy, but I really loved that bus! Do you happen to remember it and if so, do you know what model of bus it was? I hope it has been preserved. Sadly none have survived though 231, the standard MW in the article, is alive and kicking and regularly turns up at events all over Cumbria. The buses that followed that first one on the school run were usually a rear entrance and then a front entrance double decker (Britol Lodekka FS and FLF models). One of the former 550, which we often caught to school, has also been preserved. 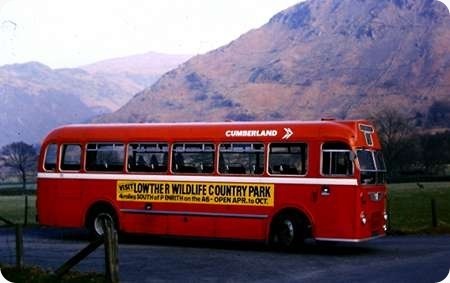 I remember from my visits to Keswick and district in the mid 1960’s that, before Cumberland took over the service, buses to Grange and Seatoller were operated by the ‘Keswick Borrowdale Bus Services’. According to Neville Mercer’s book "Independent Operators In North West England", they ceased operating in 1967, and the three Bedford ‘OB’ types still in service then found homes elsewhere. Neville’s book says that two of them survive. With regard the Leyland Nationals most likely the B series these originally based on short version and simplified heating hence no pod. Introduced about 1977. Cumberland had some of first examples but many went to Crosville to replace MWs the series 2 Nationals came in early 80s and had front radiator and available in either length as type A with pod or B type without pod. The Keswick Borrowdale Bus Services was a wonderful organisation. The contrast between the well kept OBs and the intrusion of the new fangled MW was quite something. Although the legal capacity of the OBs was considerably less than the MW the practical capacity of the OB was defined as all those that wanted to go to Keswick! The OBs always managed to keep the customer happy. If I remember correctly, only the CMS vehicles went to the bus station, the others terminating at the Moot Hall in central Keswick. My last trip on this route was on a Stagecoach open top VRT. I seem to remember it was a whitish mobile advertisement hoarding rather than the dedicated "Borrowdale Bus". My ever suffering wife recorded the familiar sounds of the Gardner engine both in motion and idling at Grange. This made an interesting comparison with the sound of the Cummins engine of an Olympian effortlessly attacking Dunmail Rise. The evil weather has dealt a severe blow to this area and our thoughts go out to the residents. A great route and responsible in 1954 for my life long bus interest. Weightmans are not recorded as having an OB, but Askew, Simpson and Youngs, (as well as Cumberland), did. Weightman though was latterly associated with Lake Hotel coaches and they did have OB’s. 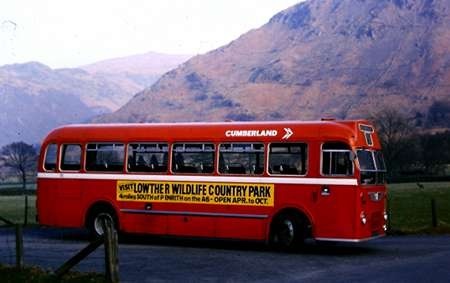 Weightman sold out to Cumberland in 1958 and the three remaining operators-with OB’s to the end-formed the Keswick Borrowdale Bus Service that lasted until 1967 when Cumberland then got the whole route.